There was mold growing in our shower because the bathroom stayed damp after anyone took a bath. To combat this problem, we took one step that worked surprisingly well. We invested in the best shower squeegee. After each shower, we use the squeegee to remove excess water from the shower doors and walls as well as the mirror. The process takes less than a minute, but we’ve noticed two positive results. The main one is that we have less mold. The second is that it keeps the shower doors and mirror looking sparkly clean. I’d like to tell you about the three best shower squeegees, beginning with the one I bought for the bathroom. I hope you’ll find one suited to your home too. The Quntis Stainless Steel Shower Squeegee caught my eye because of its sleek design. Hanging on its hook in the bathroom, it looks stylish. I especially like the smooth, ergonomic handle and silicone blade. Both parts are easy to clean with just water, and they remain sanitary. The inclusion of a mounting hook with a suction cup was a brilliant idea. It keeps the squeegee close at hand, ready for use, not forgotten in a cupboard somewhere. The tool itself weighs less than half a pound and measures just under ten inches wide. It fits the shower stall doors perfectly, and it’s light enough that the kids can manage it. The blade works just as advertised, removing water with ease. The only downside is that the handle can be a little slippery if my hands are wet. Finally, Quntis offers a 30-day money-back guarantee as well as a one-year replacement warranty. There is a similar product made by a different company. I’ll describe it for you below. Although the HASKO shower squeegee has two ways you can mount it, I wasn’t a fan of the hole in its handle. I know from experience that gunk builds up in places like those, and that makes the squeegee unsanitary. At first glance, this stainless steel tool looks a lot like the one from Quntis. They are about the same size. But there are critical differences between them. For one, the blade on the HASKO squeegee is rubber, not silicone. And based on all the complaints I saw online, plus my own experience with blades like these, I decided against this purchase. This type isn’t as capable of cleaning surfaces. The second difference is the suction cup mount for hanging the squeegee. It has a knob to tighten to increase its sticking power. The company points out that the cup will not adhere to surfaces like unfinished marble, wood, painted walls, or porcelain. I saw some reviews that said the cups wouldn’t stay stuck where placed. 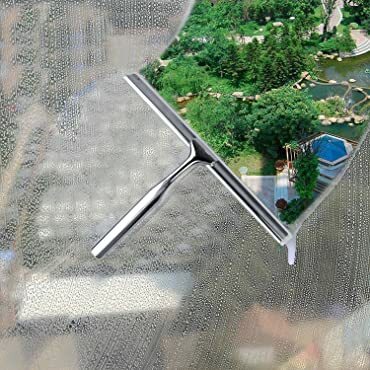 Since this squeegee comes with a 90-day money-back guarantee, you would have plenty of time to try it out and see what you think. And since both the handle and mount are chrome-plated, they should remain rust-free for a long time. My final choice is the squeegee from desired tools. It’s certainly not as elegant as the previous two products, but it’s comfortable to use. It only weighs four ounces and has a plastic handle with foam padding for better grip. The downside to the foam handle is that it is more likely to harbor germs and stay damp when left in the shower. But even if you decided against this tool for your bathroom, you might like it for your car or other cleaning duties around the house. The squeegee comes with three silicone blades, and it’s covered by a 40-day money-back guarantee plus a one-year warranty. I wanted a tool that would clean water efficiently, and silicone blades were my preferred choice. As for appearance, I wanted the squeegee close at hand, ready to use after each bath. This meant that it needed to look smart enough to remain in full view. I found that the Quntis squeegee met all my needs admirably. I’ll quickly recap the highlights of these three products. The Quntis shower squeegee is my top pick because its silicone blades clean various surfaces well. It’s a downright pretty tool that looks nice mounted on its suction cup in the shower stall. 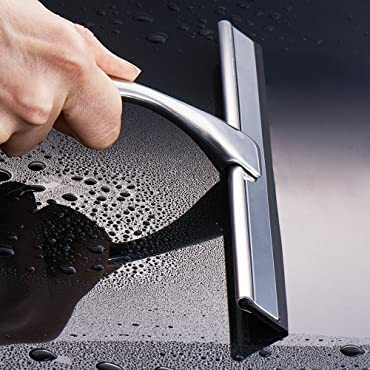 The HASKO squeegee also comes with a suction-cup mounting hook and it looks quite shiny and modern. 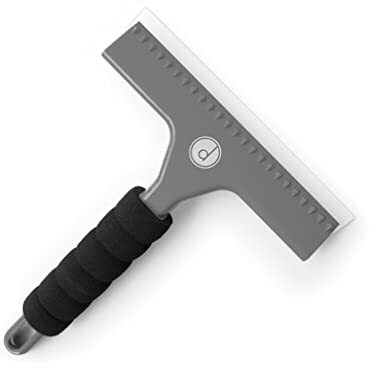 Finally, while the desired tools squeegee isn’t as beautiful, it’s comfortable to hold and use, plus it comes with extra blades. To sum up, you may find, as I did, that using a shower squeegee will help you keep mold under control. It also speeds up the cleaning process because there is less to scrub off the shower doors and walls. You may find you want more than one of these handy tools to help you clean all around the house. I hope my reviews helped you choose the best ones for your home today.